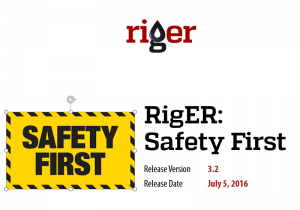 We issued new release 3.2 and added Safety module to RigER: Daily Driver’s Vehicle Inspection, Hot Work Permit, Job Safety Analysis, Near Miss Report, Safety Dashboard and Reports, Safety Officer Role. We are constantly improving users’ experience and added following features: Billing Cycle, Multi Business Entities, Billable Days, Work Ticket, Admin Settings, Advanced Integration, and other minor changes. 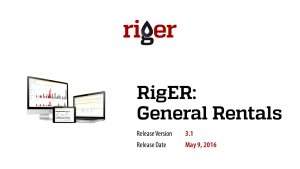 We issued new release 3.1 and add General Rentals features to RigER: Different Rental Periods, Price Management, Rental Receipts to support our clients, which refocusing some of rental equipment to construction, agricultural and other industry rentals. 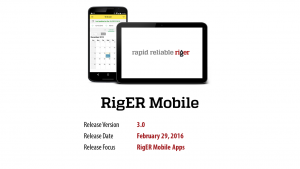 RigER Mobile iOS and Android Applications includes following Users’ Roles: Sales Person, Dispatcher and Field Technician. Main configuration was adopted for mobile applications connections. Other small improvements was done as well. 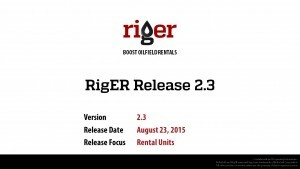 We are pleased to introduce RigER Version 2.5 – Sub-Rent and Rental Breaks. Our product becomes better and better each day. This new release is improving user experience, product usability and adding new features. 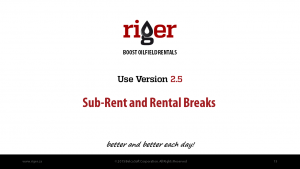 Sub Rental Subsystem has added to RigER. Version 2.5 biggest focus is on subrental operations and rental breaks. We are pleased to introduce RigER Version 2.4 – Rental Equipment Maintenance. Our product becomes better and better each day. This new release is improving user experience, product usability and enhancing oilfield equipment tracking and maintenance. Rental Equipment Maintenance Subsystem has been added to RigER. Version 2.4’s biggest focus is on equipment preventive maintenance, scheduling, and routine service tracking. Routine service and preventative maintenance is crucial for keeping equipment running at peak performance. 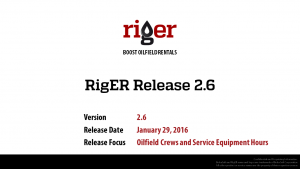 RigER can help oilfield rental companies to avoid downtime, save valuable resources and track maintenance costs. RigER version 2.3’s biggest focus is on Rental Units, allowing oilfield managers and dispatchers to see detailed activity, tracking, and efficiently control rental fleet. You can easily preview oilfield equipment status and history directly from the rental unit card. In the assembly list, you can combine different units together and make bundles, rental kits, and much more! Better and Better Each Day! We Boos Out Product to Boost Your Oilfield Rental Business! Extremely Fast and Easy to Use! 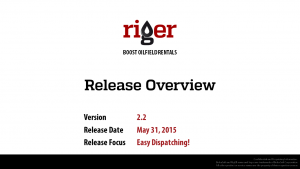 RigER v. 1.01 integrates all business processes of rental business, controls costs, and enhances profits. The software helps rental businesses increase their revenues and improves asset utilization by equipment and service tracking, automatic rental days counting, rental days invoicing (by LSDs), operational reporting and comprehensive analysis.